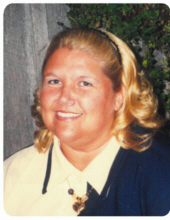 Cindy L. Blevins, 60, of Middletown, died Tuesday, February 5, 2019, at Sycamore Hospital. She was born in Hamilton on March 4, 1958 to parents Oren "Mike" and Annabelle (Wilson) Evans. Cindy worked as a dispatcher for the Oxford Police Department. She was a member of First Baptist Church Franklin. Cindy loved to travel, especially to Disney World and the beach. Ms. Blevins is survived by her daughter, Jennifer Allen; brothers, Oren Evans Jr. & Steve (Freida) Evans; sisters, Jane Ann Myers & Catherine (Robert) Davis; her three grandchildren that she adored, Venessa "Brooke" Allen, Morgan Allen & Trevor Allen; as well as many loving nieces & nephews. Memorial service will be held Saturday, February 16, 2019 at 1:00 pm at First Baptist Church Franklin, 16 West Second St., Franklin. Memorial donations may be made to First Baptist Church Franklin, 16 West Second Street, Franklin, Ohio 45005. To send flowers or a remembrance gift to the family of Cindy L. Blevins, please visit our Tribute Store. "Email Address" would like to share the life celebration of Cindy L. Blevins. Click on the "link" to go to share a favorite memory or leave a condolence message for the family.